Collection of poems in English with translations into Putonghua (modern standard Chinese) on Chinese and Australian themes; includes Noonucal traditional stories, also translated. The trip to China in September and October of 1984 was like seeing a great work of art. It opened our eyes. We were all very excited. We were all like human beings who had fallen in love at first sight. China meant different things to each member of our party of five. To Dr. Eric Tan it was a chance to expand his vast knowledge of Chinese painting from the earliest times to the present day. To Caroline Launitz—Schurer, our capable and loveable leader, it was a revelation. To Robert Adams, our comforter, it was a confirmation of what he believed, namely the role of culture in widening the horizons of people. To me it was the renewal of a hope I had entertained ever since my undergraduate days in Melbourne that humanity had a capacity for better things. To Kath Walker it was something more. China worked a great miracle in her. She had not written any poetry for years. Within forty-eight hours of arriving in Shanghai a light began to shine in her eyes. She began to sparkle: she bubbled with excitement. I remember the morning she said to me with an engaging twinkle in her eye: ‘Manning, I’m pregnant again’. She meant she had started to write poems again. From that time until we left China to return to the glitter and the tinsel of Hong Kong, and the consumer goods extravaganza of Sydney she would say to us almost every morning at breakfast: ‘I’ve got another one’. This volume of poetry is the fruit of her labour in China. It is a continuation of the themes which inform all her poetry—the wrongs the white people committed against her people, and her longing for a world in which those cruelties and barbarisms have disappeared off the face of the earth. Kath Walker is a great human being. Judith Wright was so moved by her talks with Kath Walker that she wrote a moving poem to express her feelings about the Aborigines of Australia and the wrong committed against them by the white man. These poems about China testify to the wisdom of Judith Wright’s judgement. They convey the excitement and the enthusiasm of one member of a party of Australians who were lucky enough to see a society which had a faith. Perhaps that was why Kath Walker was so moved by China. She, too, has a faith—her faith in the wisdom and the strength of her own people. On 3 November 1920, Kathleen Jean Mary Ruska was born on North Stradbroke, an island in Moreton Bay about 30 kilometres east of Brisbane, and the home of the Noonuccal tribe. There were seven children in the Ruska family, and all spent some time at the Dunwich Primary School. At the age of 13, and as an Aborigine with no future in the State Education System, Kath went into domestic service in Brisbane. She was rescued from that fate by the Second World War when she served in the Australian Women’s Army Service. Kath married Bruce Walker, a waterside worker in Brisbane, and had two sons, Denis and Vivian. She joined the Communist Party because it was the only political organisation that eschewed the White Australia Policy, but left because the Party wanted to write her speeches for her. In 1964 her first volume of verse and the first by an Australian Aborigine, We Are Going, was published (with the encouragement of Judith Wright and the aid of a Commonwealth Literary Fund) by The Jacaranda Press. Her second volume, The Dawn Is at Hand, followed in 1966. The honest and outspoken poems gained immediate acceptance and they were to be the forerunners of a considerable output which included short stories, speeches, paintings, drama and film. The Civil Rights struggle of the 60s and 70s saw Kath active on many local, State and, later, National Committees. She was Queensland State Secretary of the Federal Council for the Advancement of Aborigines and Torres Strait Islanders, Secretary of the Queensland State Council for the Advancement of Aborigines and Torres Strait Islanders, and a member of the Queensland Aboriginal Advancement League. During this time of heightened activity associated with pressure to amend Section 51 and repeal Section 127 of the Australian Constitution, Kath Walker was part of the delegation which presented the case for reform to Prime Minister Menzies. This lobbying led to one of the most important Constitutional reforms since Federation when, on 27 May 1967, 90% of the Australian Electorate supported the proposed amendments. Later she served on the Aboriginal Arts Board, the Aboriginal Housing Committee and was chairperson of the National Tribal Council and the Stradbroke Land Council. From 1972 she was Managing Director of the Noonuccal-Nughie Education Cultural Centre, as well as a remedial teacher at Dunwich School. She lectured at universities and colleges throughout Australia on subjects ranging from uranium mining to conservation and the environment to Aboriginal culture. In 1969 Kath Walker was the Australian delegate to the World Council of Churches Consultation on Racism in London, bringing the plight of her people to overseas attention for the first time. This was the beginning of many a foray into the world outside Australia. In 1972 she was guest lecturer at the University of the South Pacific in Fiji; in 1974 the official Australian envoy at the International Writers’ Conference in Malaysia; in 1975 the guest of the PNG Government at the PNG Festival of Arts; and in 1976 delegate and Senior Advisor to the Second World Black Festival of the Arts held in Lagos, Nigeria (surviving a plane hijack on her way home). In 1978–79 she won a Fulbright Scholarship and Myer Travel Grant to the United States of America and was Poet-in-Residence at Bloomsburg State College, Pennsylvania. In these same years, almost as if it were a necessary antidote to travel, she established Moongalba, or ‘sitting-down-place’, a five-hectare piece of coastal bushland on North Stradbroke Island where archaeological evidence shows that her ancestors had been in occupation for over 20 000 years. There in her caravan she welcomed visitors of all ages and races. For many Aboriginal and Islander children from the cities, this was their first experience of the natural way of life of their ancestors. For people of other races it was a rare insight into another culture. To date, over 28 000 children and adults have learned about Aboriginal food gathering practices, participated in a revival of arts and crafts, and listened to Aboriginal story tellers, and by so doing have come to understand, and more particularly respect, the often fragile but sustaining interrelationships of Australian nature. Kath was the subject of Frank Heiman’s film Shadow Sister (1977) for which she received an International Acting Award and membership of the Black Hall of Fame. In 1970 the first edition of her anthology My People (Jacaranda Press) was published, and she wrote of her childhood in Stradbroke Dreamtime (1972: Angus and Robertson). As well as being a writer she was also an artist in her own right. She illustrated her own book (Father Sky and Mother Earth, Jacaranda Press, 1981), and in 1986 a volume of her paintings (Quandamooka The Art of Kath Walker) was edited by Ulli Beier and published by the Aboriginal Artists Agency with Robert Brown and Associates. The eighties also saw further travel. 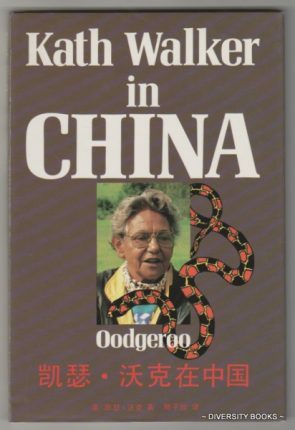 In 1985 she was a member of the Australia/China Council party which toured China, and poems written on this tour (Kath Walker in China) became the first collection written by an Aborigine to be co-published by Australian and Chinese publishing houses and presented in Chinese and English. In 1986, at the invitation of Secretary-General Gorbachev, she was a delegate to the international Forum for a Nuclear Free World for the Survival of Humanity held in Moscow. On her way home from Russia she lectured in New Delhi on ‘Aboriginal Grass Roots Culture’. And somehow in the same year she managed to be both actor and script consultant for Bruce Beresford’s film The Fringe Dwellers. The eighties also saw Kath’s close involvement with the Land Rights Movement, which culminated in despair when the Federal Labor Government refused to honour its promise to enact National Land Rights Legislation. So Kath Walker became Oodgeroo of the tribe Noonuccal, custodian of the land Minjerribah. Many of her awards she retained – the Jessie Litchfield Award, the Mary Gilmore Medal and the Fellowship of Australian Writers’ Award, but in 1987, as a Bicentennial protest, she returned the insignia of the MBE (awarded back in 1970) to the Crown via the Governor of Queensland. Notwithstanding this action, Oodgeroo and her son Kabul (Vivian) were scriptwriters and producers for the Dreamtime story The Rainbow Serpent, which was a major feature of the Australian Pavilion at World Expo 88. The text of The Rainbow Serpent was subsequently published by the Australian Government Publishing Service. 1988 also was the year of the award of an Honorary Doctor of Letters from Macquarie University. In 1989 Griffith University awarded her the degree of Doctor of the University, and 1989 saw the world premiere of The Dawn Is at Hand, a musical setting of a selection of Oodgeroo’s poetry by Malcolm Williamson, the Australian Master of the Queen’s Music. This symphonic chorale was performed in Brisbane by the Queensland Symphony Orchestra, soloists and the Queensland State and Municipal Choir.